A journey that took almost 14 years to the day is coming to an important milestone. 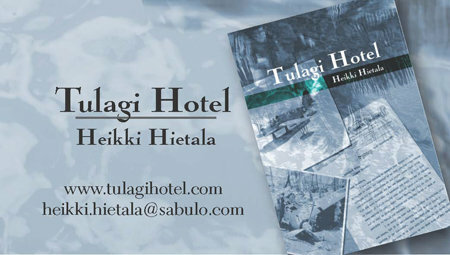 On April 14, I will go to London to attend a press launch of my book, Tulagi Hotel. I began writing it in April 1996, without a clue of the amount of work that would go into it, or what would come out of it. I say it’s a milestone as I would not want to see the journey end there. Getting it published by the small but vibrant publisher, Diiarts, is a dream come true, but the biggest wish I have is that the readership would embrace the book and pass the word. Writing this 442 page novel was sometimes a burden. There were times when I had absolutely no clue as to what would happen next, or what should happen next. At some points I was ready to commit the files I had created to an archive CD and forget I ever started it. But I never did send the files away from the hard drive; instead, I let it simmer for a while and then went back to it with fresh ideas. Then there were times when it was easy to write, days when I could produce 2,000 words a day and not have to edit at all. (Until later, when most of the words would be cast aside and replaced). And all this toing and froing finally produced a book that got its name on that April day, fourteen years ago. I showed the book to some people who encouraged me to go on, then found kind readers who edited it on their own initiative, and finally, found a publisher who believed in me and the book. Now, my dear friends, it’s your turn. It’s now up to you to see whether my story lures you in and makes you turn page after page, until you see what finally happened to Jack, Kay, Martin, and all the rest of the cast. I hope it entertains you.